Home of the best "dog-gone" deals! Forget the ’57 Chevy, the Corvette and Camaro. With 100 years of production and the auto industry’s oldest continually used nameplate, the archetypal hero vehicle for General Motors’ biggest brand is a Chevrolet truck, and it’s celebrating a century on the market. Chevy trucks turn 100 this fall, just in time for the brand to capitalize on its hard-earned, hardworking reputation with new models in the hottest parts of the market with the Traverse SUV on sale now and a new generation of pickups coming soon. “GM’s been in the truck market forever, even when it was less popular,” IHS Markit senior analyst Stephanie Brinley said. “The Silverado pickup and Suburban SUV grew up with America.” Engineered was about as basic as it gets: a one-ton flatbed with no cab, roof, doors or padding on its wooden bench seat. It was literally a horseless carriage, a mild adaptation of the age-old design that put a 36-hp 3.6L four-cylinder engine in front of the driver, where a horse would have gone a year earlier. Prices started at $1,325, a pretty penny at the time, and more than double the $600 Ford charged for the Model TT that had debuted as its first pickup a few months earlier. Until Ford and Chevrolet hit on essentially the same idea of developing a vehicle specifically to haul and tow, pickups had been modified cars. A customizer would buy a car from the factory, chop its frame up to create a longer cargo bed and get rid of unnecessary frills such as rear seats and doors. The 1918 Chevy One-Ton and Model TT created a new class of more capable and durable vehicles. GM built a whopping 384 of those Chevy trucks in 1918, all of them at a factory in Flint, not far from where GM still has a huge pickup plant. A second plant in Oakland, Calif., started building Chevy trucks for customers on the West Coast in 1919. People began to expect more from their trucks by the 1930s. The vehicles began doubling as family transportation for farmers and Chevy responded with niceties such as windows, doors fenders and running boards on its second-generation pickup. Prices started at $400. The Chevrolet Suburban essentially invented the SUV and the luxurious, truck-based people hauler when it went on sale in 1935. “It was built on a truck chassis and shared lots of sheet metal and mechanical parts with the pickups,” GM Heritage Center director Greg Wallace said. The Suburban is the auto industry’s longest continually used model name, and the progenitor of modern family-carrying 4WD vehicles. Pickups gained style and panache when legendary GM design chief Harley Earl lent his magic to the 1938 half-ton pickup, which shared some design cues with Chevrolet cars. When Detroit reinvented itself as the Arsenal of Democracy during World War II, civilian vehicle production stopped and GM plants built engines, axles and more for hundreds of thousands of troop- and cargo-carrying Chevy and GMC trucks. After the war, aerodynamic styling wraparound windshields made pickups more socially acceptable and introduced the first trucks that enthusiasts would customize and turn into hot rods. Chevy’s 1955 Cameo Carrier pickup was called “the Gentleman’s Truck,” thanks to features such as an automatic transmission and chrome bumpers. It was a signature vehicle for future GM design chief Chuck Jordan, whose other work included the ultimate expression of tail fins on the 1959 Cadillac. Pickups and SUVs grew more popular for the next four decades despite a few lulls when fuel prices rose and the economy faltered. It was the most recent step in Chevy trucks’ 100-year evolution from a doorless buckboard that just happened to have an engine instead of a horse. The Chevrolet Silverado, like many other models in the brand’s lineup, is an American icon, and it gets even better for 2017. The full-size 2017 Chevrolet Silverado starts at an MSRP of $27,585 and is available in six trim levels: WT, LS, Custom, LT, LTZ and High Country. There are three cab styles with Regular Cab, Double Cab and Crew Cab, three box lengths (5’8”, 6’6” and 8’) and all models can be equipped with four-wheel drive. With all of the recent additions to the Silverado lineup, AutoTrader noted “the latest Silverado makes an excellent case for itself as one of today’s top pickup trucks.” That’s no surprise for the pickup that was named “Highest Ranked Large Light Duty Pickup in Initial Quality, Two Years in a Row” by J.D. Power. That didn’t stop Chevrolet from making the 2017 model even better. There are two new exterior colors (Pepperdust Metallic and Graphite Metallic) and a capless fuel fill, and the newest model is standard with the Teen Driver feature that promotes safe driving habits by letting parents view various driving information during their child’s time out with their vehicle. The Enhanced Driver Alert Package now features Low Speed Forward Automatic Braking, and Crew Cab models now have the segment’s best max trailering rating of 12,500 pounds. Safety is a Silverado highlight with six airbags, StabiliTrak Electronic Stability Control, Rollover Mitigation technology, Hill Start Assist and Trailer Sway Control, all standard. A rear vision camera is available. The Enhanced Driver Alert Package (standard on High Country models) adds IntelliBeam headlamps with automatic high-beam control, Front and Rear Park Assist, the Safety Alert Driver Seat, Lane Keep Assist, Forward Collision Alert, and the new Low Speed Forward Automatic Braking. You also get the peace of mind that comes with the OnStar® vehicle telematics system. There are three engines available for the Silverado, including a 4.3-liter V6, 5.3-liter V8 and 6.2-liter V8. The V6 makes 285 hp and 305 lb/ft of torque, while stepping up to the 5.3-liter V8 gets you 355 hp and 383 lb/ft of torque, with more than 300 lb/ft of torque available from 2,000 to 5,600 rpm. The 6.2-liter V8 produces a potent 420 hp and 460 lb/ft of torque. All engines employ a trifecta of technologies including direct injection, Continuously Variable Valve Timing and Active Fuel Management to make the most out of every drop of fuel. An eight-speed automatic transmission is also available. The exterior of the Silverado is rugged yet refined with available unique features like the CornerStep rear bumper, EZ Lift and Lower Locking Tailgate, cargo box LED lighting, and power-articulating running boards. Wheels range from 17-inches to 20-inches so you’re sure to find exactly what you’re looking for. Inside, Chevrolet MyLink® with an eight-inch color touch screen helps keep you connected and you can also add supple leather upholstery. Wireless phone charging, a Bose® sound system, Bluetooth® wireless connectivity, dual zone automatic climate control and a heated steering wheel are also available. You can also add an abundance of packages and accessories to make the Silverado as unique as you are. Add in two years/24,000-miles of complimentary maintenance (two visits), a three-year/36,000-mile Bumper-to-Bumper Limited Warranty and five-year/60,000-mile Powertrain Limited Warranty with courtesy transportation and roadside assistance, and the Silverado is hard to beat. Stop by today to let us know you’re interested in the Silverado and we’ll show you some of the impressive models that can help you get the job done. This article is presented by Jack Maxton Chevrolet in Worthington, Ohio. Camping season is in full swing. Most parks opened up last month and with school’s dismissing soon for the summer, these five great campgrounds in Ohio are sure to be bustling with activity. Located in Deersville, Tappan Lake accommodates more than 500 campsites with full hookups and electric, vacation cabins and camper cabins. More than 2,300 acres of water surface are on hand, ready for swimming, boating and fishing. Meanwhile, the 5,000 acres of land are great for hiking a trail that connects the park to the Tappan Wetlands, a designated watchable wildlife area. You can also play on one of the three playgrounds or engage in some sporting activities such as basketball, tennis, volleyball or horseshoes. The activity center has free Wi-Fi, a laundromat and a nature center, which is the home for many daily programs and activities for children. For more information, visit http://tappanpark.mwcd.org/. Alum Creek’s 3,387-acre reservoir and 4,630 acres of gently rolling fields and woodlands provide a nucleus of recreational activity just minutes from Ohio’s capital city. Quiet coves nestled among shale cliffs await the solitary fisherman in the park’s northern reaches, while sun-seekers mingle on the state’s largest inland beach. Playground equipment, basketball courts, horseshoe pits, a swimming beach and a boat ramp are designated for campers’ use only, while seemingly endless miles of hiking biking trails run throughout the park, as well. 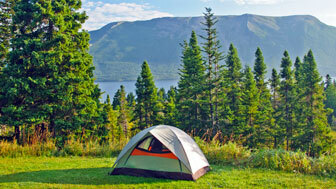 There are camping experiences for everyone here — with almost 300 campsites with 50-amp electrical hookup, three sites that provide a full hookup service including sewer, electricity and water, 30 primitive sites and a group camping area for reserved retreats. For more information, visit http://parks.ohiodnr.gov/alumcreek. Hocking Hills in Logan provides a variety of recreational opportunities in a grand natural setting. The 2,356-acre park has towering cliffs, waterfalls and deep shaded gorges to lure the hiker and naturalist and serve as a backdrop to popular facilities and accommodations. Activities include archery, fishing, nearby hunting, picnicking, pool swimming, hiking and cave exploring, biking and horseback riding. There is no shortage of room for you, as Hocking Hills boasts 15 resorts and campgrounds ranging from cabins to tents to tepees. For more information, visit http://www.hockinghills.com/camping.html. The 5,800-acre Indian Lake in Lakeview offers a variety of water-related recreational opportunities including boating, fishing, skiing, hiking, biking and more. Two public beaches provide 1,400 feet of shoreline access to the lake that is surrounded by the 800 acre multi-use park. Nearly 450 family campsites suitable for tents or trailers are available near the lakeshore, and three deluxe cabins can be rented from May through October each year. For more information, visit http://parks.ohiodnr.gov/indianlake or http://www.indianlakearea.com/indian_lake_state_park.htm. This 1,095-acre park is nestled in the woodlands of Appalachia near the banks of the Ohio River in Portsmouth. Once the hunting grounds of the Shawnee Indians, the region is renowned for its rugged beauty. Roosevelt and Turkey Creek Lakes provide two public beaches for swimming and 68 acres for boating and aquatic sports and fishing. Six hiking trails traverse the park, along with two bridle trails for 60 miles of backpacking through the wilderness of Ohio. An 18-hole championship golf course is located nearby, along with mini golf, volleyball, basketball and courts, playground equipment and more to be found at the park. The nature center is open from Memorial Day through Labor Day, with more than 100 sites suitable for camping in tents or trailers there, plus two camper cabins, 25 cottages and a 50-room lodge. For more information, visit http://parks.ohiodnr.gov/shawnee. Enjoy all the environment of Ohio has to offer, anywhere in Ohio, at the stellar above campsites or any of the many others throughout the state. Motor Trend named the 2015 Chevrolet Colorado pickup its Truck of the Year, edging out Ford’s aluminum-bodied F-150. The award from the influential magazine should give General Motors a marketing boost as it seeks to revive interest in the market for midsize pickups. It launched the Colorado and sibling GMC Canyon this fall. “The editors were particularly impressed with Colorado’s handsome, clean-sheet design, ‘right-sized’ package, excellent handling, and overall capability,” the magazine said. The company’s ability to “create a true North American capable truck for this part of the planet and beat a serious new competitor is just spectacular,” he added. The magazine also praised the Colorado’s “potent yet efficient powertrains,” which include a 2.5-liter four-cylinder engine and a 3.6-liter V-6. Editors put each truck through the paces in real-world road tests without payload or trailered loads, including a 0-60 mph and quarter-mile acceleration, 60-0 mph braking and maximum lateral grip tests. Testing with payload and trailers was done in the Arizona desert and at a proving grounds. The contest also included a test to record “accurate, real-world fuel economy” through use of exhaust gas and “flow rate” analyzers to measure tailpipe emissions each second during a three-hour, 88-mile drive around the Los Angeles area, near the magazine’s headquarters in El Sugundo, Calif. The 2015 Chevrolet Colorado is the “just right” pickup truck for many drivers – drivers for whom the size of a full-size truck feels like too much. The 2015 Chevrolet Colorado, available here at Jack Maxton Chevrolet in Worthington, Ohio, is all-new from front to back, top to bottom and even underneath. It’s a reinvention of the midsize truck that delivers unmatched efficiency, capability, refinement and rugged performance. It begins with the Colorado Base (MSRP $20,120. The standard Extended Cab/long box (six feet, two inches) configuration can be swapped for a Crew Cab/short box (five feet, two inches) or Crew Cab/long box setup, instead. The long box can accommodate eight-foot long items with the tailgate down. A segment-best 200 hp is provided by the standard direct-injected 2.5-liter four-cylinder engine, which also delivers 191 lb/ft of torque. A six-speed manual transmission routes output to the rear wheels. This powertrain rewards Colorado drivers with best-in-segment fuel economy, EPA-estimated at 27 mpg highway. Other standard features include four-wheel antilock disc brakes with four-piston front calipers and Duralife™ brake rotors, power-adjustable folding exterior mirrors, a rearview camera, a locking tailgate, a theft-deterrent system and a chrome CornerStep rear bumper. 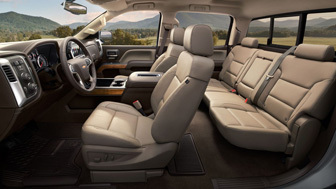 The Colorado interior offers the comfort of a good sedan. Inlaid, triple-sealed doors, thick window and windshield glass, and sound-deadening materials are used to create a quiet cabin free of wind and road noise. Front bucket seats, a four-way power-adjustable driver’s seat, and a six-speaker audio system with 4.2-inch LCD screen, USB port and auxiliary input are included, as well. The Colorado WT (Work Truck) comes with a six-speed automatic transmission in Crew Cab models, which also feature a folding rear bench seat. Dual rear seats with under-seat storage are standard in Extended Cab models. In Crew Cab/short box 4×4 and Crew Cab/long box trim, the Colorado WT adds more muscle by way of a 3.6-liter V6 engine that also delivers segment-best horsepower. This aluminum-alloy engine is strong––with 305 hp and 269 lb/ft of torque––and it’s also efficient, returning a best-in-class EPA-estimated 26 mpg highway. The Colorado LT carries the six-speed automatic transmission and also features OnStar Directions and Connections with a six-month service plan included. The outside mirrors body color, there are chrome moldings along the beltline and the Colorado LT rides on standard 17-inch Blade Silver Metallic cast aluminum wheels. Inside, the standard Chevy MyLink audio system comes with a customizable eight-inch color touch-screen. MyLink pairs with your smartphone and allows easy, touch-and-swipe or voice-activated control over audio, apps and more, plus it features Text Messaging Alerts and, for iPhone users, Siri Eyes Free. You’ll enjoy three free months of SiriusXM Satellite Radio All-Access Package, Bluetooth, four USB ports, audio and cruise controls on the leather-wrapped steering wheel, and remote keyless entry. The Colorado LT also offers OnStar 4G LTE and Wi-Fi hotspot technology. The Colorado Z71 (MSRP $27,630) is even better-equipped than the LT. The “Z71” badging underscores plenty of substance. Its Z71 Off-Road Suspension features twin-tube shock absorbers that can take a pounding and an automatic locking rear differential that maximizes traction. Four-wheel drive models also get a protective shield for the transfer case. Other enhancements include front recovery hooks, Hill Descent Control, foglamps, and an EZ Lift & Lower tailgate that’s available in the other trims. The Colorado Z71 is tough, and it’s also comfortable and convenient. There’s remote start, heated front seats (also available in LT trims) four-way power-adjustable front seats with power lumbar, and handsome, 17-inch Dark Argent cast aluminum wheels. LT and Z71 trims can be equipped with a seven-speaker Bose audio system, as well as navigation. The 2015 Chevrolet Colorado is ready to go to work. Like the Silverado, it’s built on a strong, fully-boxed frame, and the available four-wheel drive system has an electronically controlled transfer case with “2WD,” 4WD HI,” and “4WD LO” settings. The Colorado offers a best-in-class maximum trailering capacity of 7,000 pounds and best-in-class payload of 1,590 pounds. Its gross vehicle weight rating starts at 5,400 pounds and goes as high as 5,900 pounds. The standard 4.10:1 rear axle ratio is great for putting the torque to work, and an available 3.42:1 axle is available to enhance fuel economy. The 3.6-liter V6 engine is standard with the 3.42 axle. Advanced, segment-first driver assistance/safety features that are available in the Colorado include Forward Collision Alert and Lane Departure Warning. Standard bed-rail and tailgate protectors are included, and there are thirteen tie-down spots in the bed that can be used with the available, moveable cargo tie-down rings. Utility can be enhanced even more with the addition of the all-new GearOn™ storage system and available accessories and appearance enhancements. The GearOn™ Bars package, for example, includes cargo tie-down rings and tiered storage cross rails, while the GearOn™ Bed Divider and GearOn™ Utility Rack increase cargo carrying flexibility and capability. The 2015 Chevrolet Colorado sets a new standard for midsize pickups. There’s still quite a bit more to the 2015 Colorado, so come in and experience all it offers for yourself today. While you’d be forgiven for thinking the United States has a national obsession with full-size pickup trucks, there are a lot of drivers who want the utility without the bulk. The 2015 Chevrolet Colorado, available soon here at Jack Maxton Chevrolet in Worthington, Ohio, is a fully-modern option for the midsize-truck buyer. While other automakers have largely ignored this slice of the market, Chevrolet brings a new generation of capability, styling and refinement. The 2015 Chevrolet Colorado has a confident stance and projects a sporty demeanor. It has an athlete’s poise, and its design is exclusive to the North American market. The bedside height matches the raked beltline of the cab, resulting in a tightly integrated look and providing more security for cargo. Available configurations include Extended Cab with a six-foot bed, Crew Cab with five-foot bed, and Crew Cab with six-foot bed. Drop the tailgate and the six-foot bed can accommodate an eight-foot-long item. Trim levels for the 2015 Chevrolet Colorado are WT (Work Truck), LT and Z71, and all offer your choice of rear-wheel or four-wheel drive. The Z71 is the burliest Colorado, and you’ll be able to spot it by the gunmetal grille surround in place of the chrome on other models, 17-inch aluminum wheels and projector headlamps. Every Colorado benefits from designed-in refinement. There are triple-sealed doors that nestle into the body sides, just like those of the new full-size Silverado, which has won much recognition for its quiet interior. An aluminum hood keeps weight in check, and the active aero grille shutters, a first in this segment, shut on the highway, improving aerodynamics and, in turn, efficiency. Standard equipment levels for the 2015 Colorado are high. The CornerStep rear bumper is an elegant way to easily get in and out of the bed, and the EZ Lift-and-Lower tailgate includes a damper for controlled lowering. Inside the bed is a standard two-tier loading system. Upper and lower bed sections allow handy storage of items you’d like to conceal, like tools. There are also thirteen standard tie-down locations and movable rings to secure cargo. The cabin design is clean, and features include an easy-to-read instrument panel, a center console with floor mounted shifter, and premium detailing. You’ll also notice the sculpted headliner for better headroom, halo lighting that points out key controls, and high-comfort seats that use dual-firmness foam. The standard 2.5-liter four-cylinder engine is rendered in lightweight aluminum and features direct fuel injection and variable valve timing. It delivers 193 hp and 184 lb/ft of torque from the end of its forged crankshaft, and it’s paired with a six-speed automatic transmission. A six-speed manual is also available for some models. More power can be had from the available 3.6-liter V6, which supplies 302 hp and 270 lb/ft of torque. Soon, the Colorado will also be the only midsize truck available with a diesel engine. The Colorado will offer a brawny 2.8-liter Duramax four-cylinder turbodiesel, and, regardless of engine, it’s clear that the Colorado packs heavyweight capability into a tidy package. Modern pickup trucks of any size must be more than just work vehicles. With so many trucks serving as daily drivers and family vehicles, the Colorado was designed to take these uses into account. That’s why there’s a variety of cab configurations, a fully-boxed perimeter frame, four-wheel disc brakes with Duralife™ rotors, and a list of available features that includes the sophisticated Chevrolet MyLink system, navigation and luxurious leather seating. 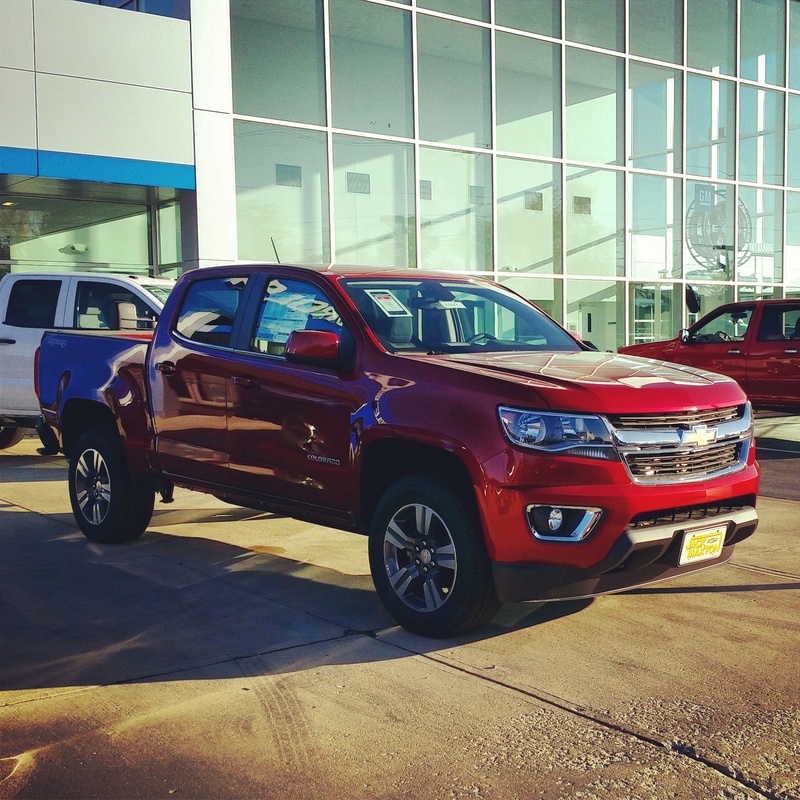 In a time when a truck must be many things for many different people, the 2015 Chevrolet Colorado stands out as the only small pickup on Car and Driver magazine’s list of “25 Cars Worth Waiting For from 2015-2018.” Stop in often for more details and updates on availability, and be one of the first to see and drive the new 2015 Chevrolet Colorado when it arrives later this year. The all-new 2015 Chevrolet Colorado, available soon here at Jack Maxton Chevrolet in Worthington, Ohio, is rewriting the midsize truck rule-book. With an all-new design, class-leading ability and new powertrain options, the 2015 Colorado will be the most capable midsize pickup Chevrolet has ever created. The all-new 2015 Chevrolet Colorado (MSRP TBD) packs a full-size punch. Just like the full-size Silverado, the Colorado is being offered with a choice of body styles, bed lengths and drivetrain options, allowing you to build the perfect truck for you. Extended Cab and Crew Cab models are both available with standard or long-box bed lengths, and engine choices include a 2.5-liter four-cylinder, a 3.6-liter V6 and a 2.8-liter turbodiesel. Official data has yet to be released, but Chevy estimates the power output of the 2.5-liter engine to be 193 hp and 184 lb/ft of torque. The V6 is estimated to produce 302 hp and 270 lb/ft of torque. Those numbers will make the Colorado the most powerful in its segment. Chevy estimates a maximum tow rating of more than 6,700 pounds for a properly equipped Colorado, again best in class. For even more power and towing capability, the Colorado will also be offered with a 2.8-liter four-cylinder Duramax® turbodiesel engine (2015 availability), making it the first and only diesel-powered truck in the segment to be offered in the United States. Transmission choices include a six-speed automatic with Tow/Haul Mode that’s standard in most models and a six-speed manual that’s available in the entry 2.5-liter trim. The Colorado will also offer the option of rear-wheel drive or four-wheel drive across the model line. To make the 2015 Colorado is the most capable truck in the segment, Chevrolet carried as many features over from the Silverado as possible. A fully boxed frame adds strength and provides a solid platform for the suspension, contributing to the smooth and refined ride of the all-new Colorado. The four-wheel disc braking system features the same Duralife™ brake rotor technology that debuted on the 2014 Silverado. Another carry over from the larger trucks is the availability of the G80 automatic locking rear differential. Even the CornerStep rear bumper design carries over from the larger Silverado. 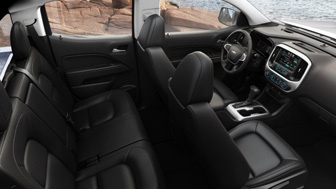 While Chevrolet focused on providing full-size ability in a midsize platform, the Colorado was also built to set a new benchmark in comfort and refinement. The door panels and headliner have been sculpted to increase interior space without increasing the overall size of the truck, and the doors are triple sealed to provide unparalleled aerodynamic performance and quietness. The Colorado even features an aluminum hood and active aero grille shutters to increase fuel economy, both segment firsts. The new Colorado will be the first midsize truck to offer built-in 4G LTE connectivity. Other technology features include an eight-inch touch-screen display, available navigation, and the next-generation Chevrolet MyLink system featuring gesture and voice control. Through the available OnStar system, the Colorado becomes a rolling Wi-Fi hotspot that gives you a reliable connection to the internet. Why do we recommend ACDelco dexos™1 certified engine oil?